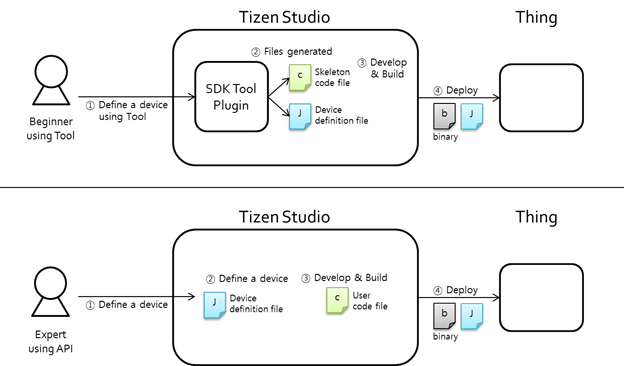 Common set API, which means that the Tizen IoT API is based on the Tizen 4.0 common profile. The API supports the common set of mobile, wearable, and TV profiles and allows you to make IoT applications, such as network audio applications. Available platform binaries, which allow you to efficiently create an IoT application. Tizen Common Headed binaries for Raspberry Pi 3 and ARTIK 530 have passed the API test verification, which means that you can create IoT applications with a productive quality. In Preview 1, the Tizen IoT API releases only the native "C" API. Other convenient language types for the API are to be considered in the future. The following table lists the IoT-specific Tizen platform API group. Developing "Things" which are market-ready (with cloud support) has been a challenge for most of the companies and individual developers. The SmartThings™ Things SDK API helps you to create new IoT devices easily. The version number of the first release is 0.9, which is the preview version. For more information on the configuration file details, see Device Definition. For more information on using the SmartThings™ Things SDK API, see API Usage. Defines device and platform information. Defines resources that the thing is supporting. Hide the interface and resource type details in a request data. Divide a collection resource request into single resource requests. Provide the "property_key" in case of the GET request. Supporting pin-based and UserConfirm(Certificate)-based OTM in EasySetup. Includes Single resource and Collection resource support. Resources that are defined in a JSON file/string are made internally. Supports request methods: GET and POST. You only need to make a representation (bundle of property values) for a response. You do not need to handle interfaces, as they are handled internally. The request to a collection resource is divided into individual requests to single resources. Cloud setup (Sign-up/Sign-in/Sign-out/Resource publish to cloud) is handled internally. To respond to an Access Point List (APList) request from a client. To start and stop softAP. To connect to a target WiFi AP (Enroller). To make the whole response data according to the interfaces (such as oic.if.baseline, oic.if.b, and oic.if.ll). The following figure illustrates the SmartThings™ Things API life-cycle. You must define the highlighted code in the above example. The st_XXX() functions come from the ST Things SDK API. For more information, see the API Documentation. The key difference is the req_msg->resource_uri value passed in the callbacks to distinguish the 2 resources. Since the resource URI is unique in the device definition, each resource can be handled separately. The following table lists the resource types supported by IoTivity. The following table shows the IoTivity interfaces that specify how the device returns its response. These interfaces can be used by the IoTivity client (such as Samsung Connect) to retrieve information from the server (device). Baseline oic.if.baseline Includes all information about the resource, including metadata and collection information. This is the default interface type. 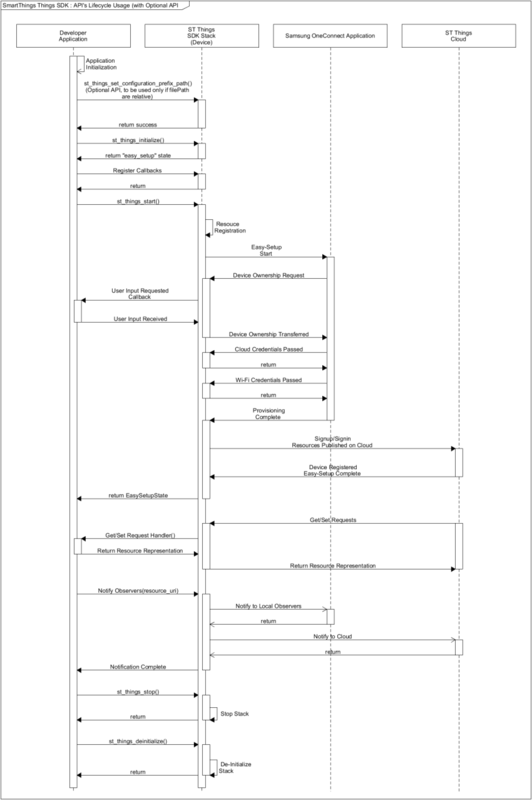 Linked List oic.if.ll Includes only the collection information about the resource. This is the default interface type for /oic/res. Batch oic.if.b Allows for the aggregation of interaction with all resources. Each resource is interacted with separately, but their responses are aggregated. The following table lists other interface types that are related to permissions. These interfaces are relevant for retrieve and update requests. Read oic.if.r Allows values to be read. Read Write oic.if.rw Allows values to be read and written. Actuator oic.if.a Allows creating, updating, and retrieving actuator values. Sensor oic.if.s Allows sensor values to be read. Since each peripheral supports different interfaces and protocols, you must check from the peripheral's specifications whether a specific protocol is supported. Peripheral I/O APIs are categorized based on the protocol. The following table lists the supported protocols for the Tizen IoT hardware targets. The following figures illustrate the pinout information for the Tizen IoT hardware targets. 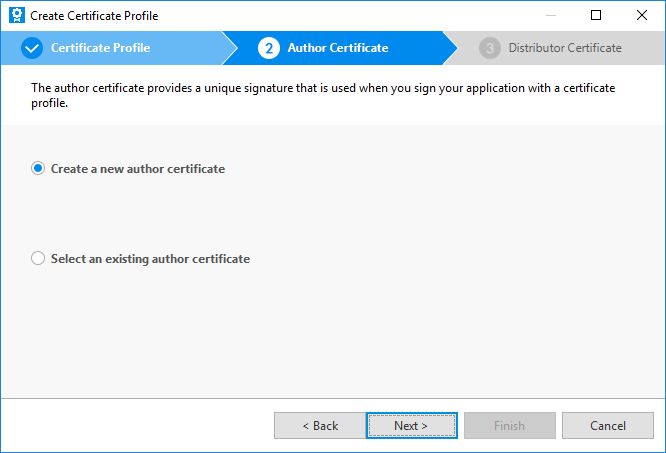 To open the Certificate Manager, in the Tizen Studio menu, go to Tools > Certificate Manager. 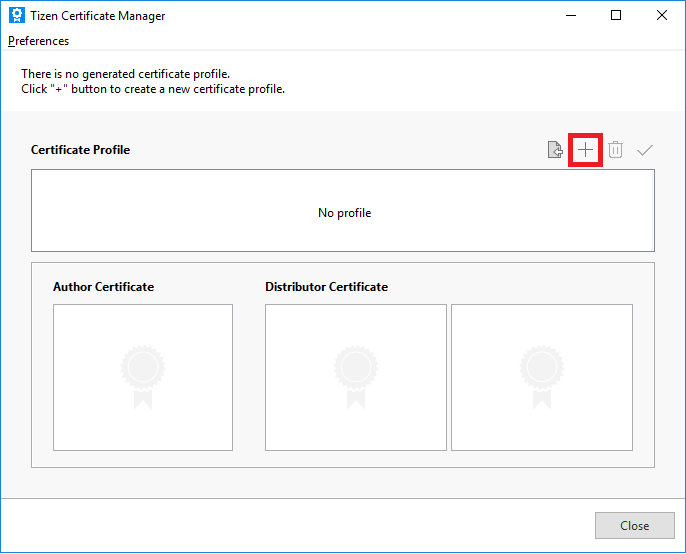 To add a new certificate profile for signing your application, click + in the Certificate Manager and enter a profile name. 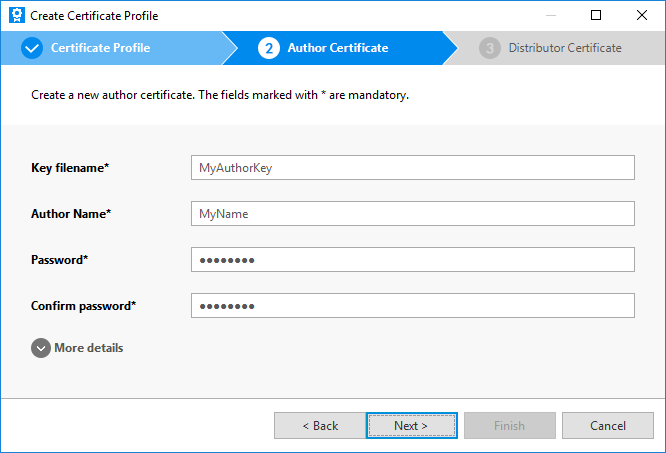 Select Create a new author certificate and click Next. Enter the key file name, author name, password, and password again. 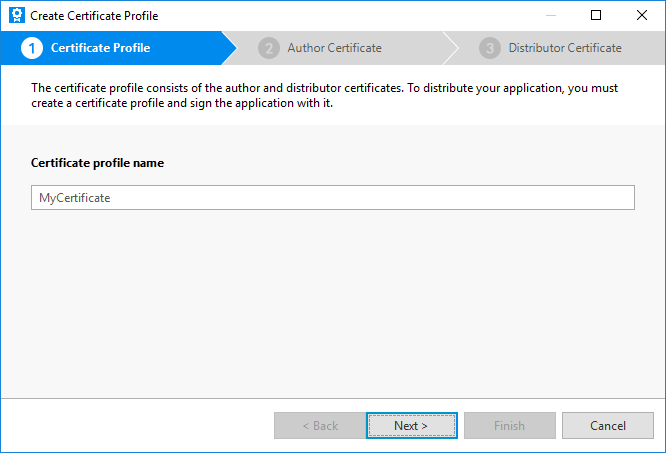 If you want to provide more information for the certificate, enter the details after unfolding the More details section. 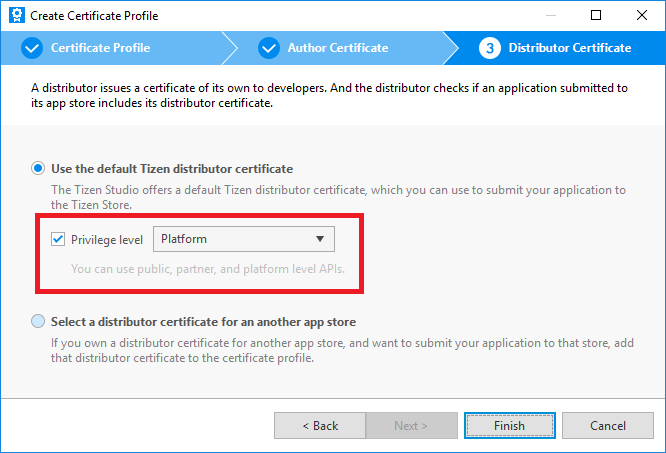 Select Use the default Tizen distributor certificate and the Platform privilege level, and click Finish. 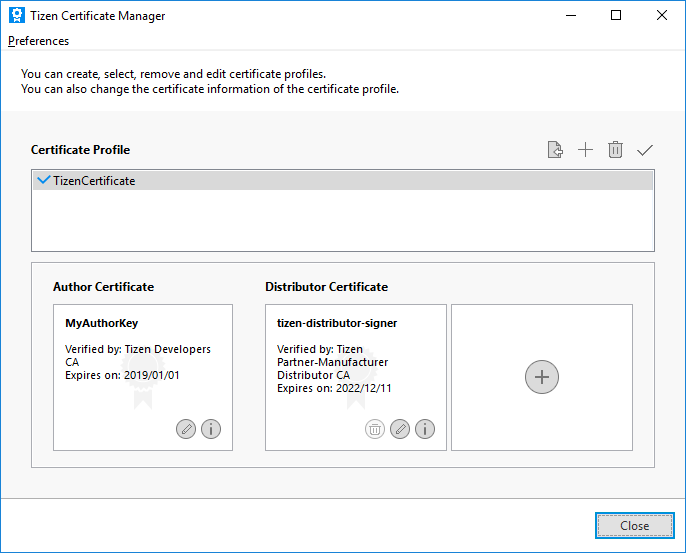 The new platform-level certificate is created and shown in the Certificate Manager. GPIO (General-Purpose Input/Output) is a programmable interface for reading the state of binary input peripherals, such as a switch, and controlling the state of binary output peripherals, such as a LED. GPIO sets a direction for the data transfer. It can also detect an interrupt signaled by a level transition: either a falling edge (high to low) or a rising edge (low to high). To detect the interrupt signal you want, set the appropriate edge mode. Rising mode detects data changes from low to high. Falling mode detects data changes from high to low. The pin parameter required for this function must be set according to the following tables. NoteFor more information on the pin names and locations, see Supported Protocols. PERIPHERAL_GPIO_DIRECTION_IN: Input mode to receive data from a binary output peripheral. PERIPHERAL_GPIO_DIRECTION_OUT_INITIALLY_HIGH: Output mode to send data to a binary output peripheral. This value initializes the output peripheral state as high. PERIPHERAL_GPIO_DIRECTION_OUT_INITIALLY_LOW: Output mode to send data to a binary output peripheral. This value initializes the output peripheral state as low. NoteTo set the data direction to PERIPHERAL_GPIO_DIRECTION_OUT_INITIALLY_HIGH or PERIPHERAL_GPIO_DIRECTION_OUT_INITIALLY_LOW, the edge mode must be set to PERIPHERAL_GPIO_EDGE_NONE. PERIPHERAL_GPIO_EDGE_RISING: Interrupted at a rising edge (low to high). PERIPHERAL_GPIO_EDGE_FALLING: Interrupted at a falling edge (high to low). PERIPHERAL_GPIO_EDGE_BOTH: Interrupted at both rising and falling edges. 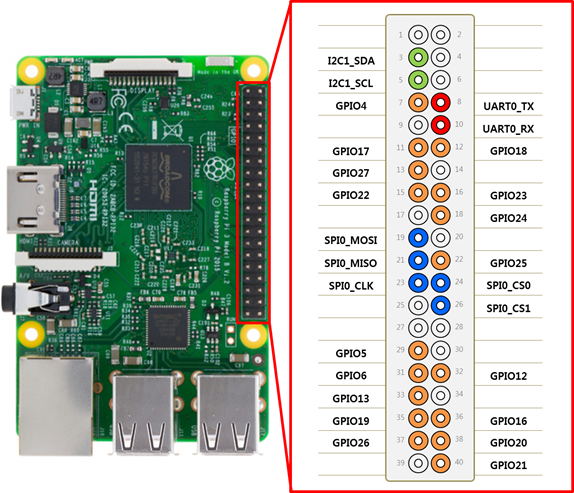 NoteTo set the edge mode to PERIPHERAL_GPIO_EDGE_RISING, PERIPHERAL_GPIO_EDGE_FALLING, or PERIPHERAL_GPIO_EDGE_BOTH, the data direction must be set to the PERIPHERAL_GPIO_DIRECTION_IN. The interrupted callback is called when the GPIO state changes, based on the selected edge mode. The interrupted callback is unset when the peripheral_gpio_unset_interrupted_cb() function is called or when the callback receives an error value other than PERIPHERAL_ERROR_NONE. Define the interrupted callback content. NoteTo write binary data, the data direction must be set to PERIPHERAL_GPIO_DIRECTION_OUT_INITIALLY_HIGHor PERIPHERAL_GPIO_DIRECTION_OUT_INITIALLY_LOW. PWM (Pulse-Width Modulation) is a programmable interface that allows you to, for example, control motor speed or change light brightness. Peripherals that support PWM are controlled by the current strength. To modulate the current, the voltage needs to be modulated. The voltage is proportional to the intensity of the current. The period is a constant interval at which the pulse repeats. The duty cycle is the constant time within 1 period in which a signal is active. 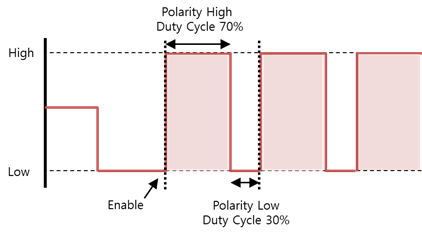 A "polarity high" signal starts high for the duration of the duty cycle and goes low for the remainder of the period. Conversely, a "polarity low" signal starts low for the duration of the duty cycle and goes high for the remainder of the period. The pulse repeats if repetition has been enabled. For example, if the period is 10,000,000 nanoseconds and the polarity high duty cycle is 7,000,000 nanoseconds, the average voltage is at 70%. The chip and pin parameters required for this function must be set according to the following table. To set the period, use the peripheral_pwm_set_period() function. The following example sets the period to 20 milliseconds. The unit is nanoseconds. To set the duty cycle, use the peripheral_pwm_set_duty_cycle() function. The following example sets the duty cycle to 2 milliseconds. The unit is nanoseconds. SPI (Serial Peripheral Interface) is a programmable interface for transferring data quickly to peripherals that require high performance. The SPI protocol is a serial communication method that controls the clock signal as master and other peripherals connected to SPI as slaves. This protocol is used by peripherals, such as heart-beat pulse sensors and graphic displays, that require fast data transfer. CLK (SCLK or SCK) is a simple synchronization signal and a communication clock. The data flows from the master to the slave in the MOSI (Master Out Slave In) line, and from the slave to the master in the MISO (Master In Slave Out) line. Full duplex data communication is possible with 2 lines (MOSI and MISO). CS (Chip Select) is a signal for selecting a slave device. SPI supports half duplex read/write and full duplex transfer. Each of the 4 available SPI modes defines a specific combination of clock polarity (CPOL) and clock phase (CPHA). SPI MODE 0 0 0 CLK (Clock) is first low and data is sampled on the rising edge of each clock pulse. SPI MODE 1 0 1 CLK is first low and data is sampled on the falling edge of each clock pulse. SPI MODE 2 1 0 CLK is first high and data is sampled on the falling edge of each clock pulse. SPI MODE 3 1 1 CLK is first high and data is sampled on the rising edge of each clock pulse. The bit order refers to the sequential order in which bytes are arranged into larger numerical values. MSB indicates that the most significant bit is transmitted first. LSB indicates that the least significant bit is transmitted first. The bit per word refers to the number of bits to be transmitted at a time when data is exchanged with a connected slave. Normally, it is set to 8 bits per word. The frequency refers to the clock signal in Hz. Since the frequencies are different for each slave device, the applicable value must be checked from the peripheral's specification. The bus and chip_select parameters required for this function must be set according to the following tables. PERIPHERAL_SPI_MODE_0: CLK is active high and sampled at the rising edge. PERIPHERAL_SPI_MODE_1: CLK is active high and sampled at the falling edge. PERIPHERAL_SPI_MODE_2: CLK is active low and sampled at the rising edge. PERIPHERAL_SPI_MODE_3: CLK is active low and sampled at the falling edge. PERIPHERAL_SPI_BIT_ORDER_MSB: Use the most significant bit first. PERIPHERAL_SPI_BIT_ORDER_LSB: Use the least significant bit first. NoteThe ARTIK 530 and Raspberry Pi 3 boards do not support the LSB bit order. To set the frequency, use the peripheral_spi_set_frequency() function. The frequency unit is Hz. I2C (Inter-Integrated Circuit) is a programmable interface that allows you to communicate with I2C peripherals. Master device generates the clock and initiates communication with slaves. Slave device receives the clock and responds when addressed by the master. 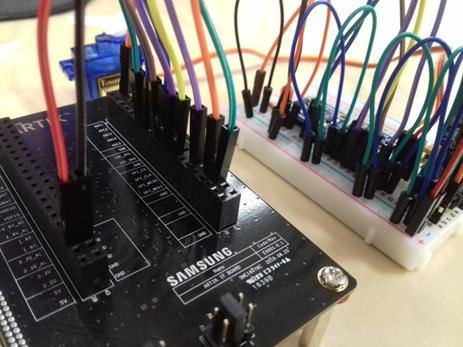 To allow the I2C master to connect to 128 I2C slave devices, an I2C slave device provides a 7-bit address. Since most slave addresses are determined by the manufacturer, refer to the specification to find the slave device address. Using the I2C bus, the master controls signal lines called SCL (Shared CLock) and SDA (Shared DAta) to read or write data to or from the device. SCL is a clock line for communication synchronization, and SDA is a data line. The master outputs the clock for synchronization with the SCL, and the slave outputs or receives data through the SDA according to the clock output to the SCL. If the SDA line is used alone, only half duplex communication is possible because data is sent only to 1 line. The bus parameter required for this function must be set according to the following table. The address parameter must be set based on the peripheral specification. UART (Universal Asynchronous Receiver-Transmitter) is a programmable interface that allows you to communicate 1:1 with a UART peripheral. 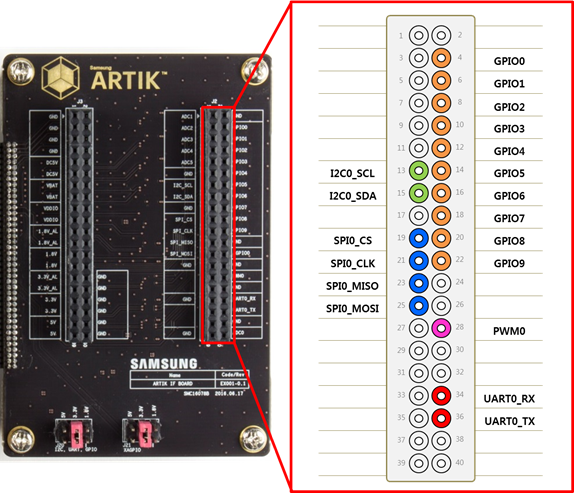 UART is an interface for exchanging data with peripherals. It is an asynchronous method that transmits data without a clock line, and consists of only 2 data lines: transmit (Tx) and receive (Rx). UART performs 1:1 communication. Indicates the start of the communication before sending data and holds it for a bit time length. Transmits 5 to 8 bits of data. Generates and transmits a parity value for error verification, and determines a receiving side error. The following options are available: None, Even, and Odd parity. Selecting None removes this bit. Indicates the termination of the communication and holds 1 or 2 bits. Asynchronous transmission/receiving speeds must be matched to the peripheral. For this purpose, the number of signals transmitted per second can be synchronized with a peripheral. It is called the Baud. If a device supports a 5-wire UART port, hardware flow control can be used to increase the reliability of the data transmission. Software flow control can also be used to increase reliability. The port parameter required for this function must be set according to the following tables. PERIPHERAL_UART_BYTE_SIZE_5BIT: Byte size is 5 bits. PERIPHERAL_UART_BYTE_SIZE_6BIT: Byte size is 6 bits. PERIPHERAL_UART_BYTE_SIZE_7BIT: Byte size is 7 bits. PERIPHERAL_UART_BYTE_SIZE_8BIT: Byte size is 8 bits. PERIPHERAL_UART_PARITY_EVEN: Parity bit is even. PERIPHERAL_UART_PARITY_ODD: Parity bit is odd. PERIPHERAL_UART_STOP_BITS_1BIT: 1 bit is used for stop bits. PERIPHERAL_UART_STOP_BITS_2BIT: 2 bit is used for stop bits. PERIPHERAL_UART_SOFTWARE_FLOW_CONTROL_NONE: No software flow control. PERIPHERAL_UART_SOFTWARE_FLOW_CONTROL_XONXOFF: Software flow control uses XONXOFF. PERIPHERAL_UART_HARDWARE_FLOW_CONTROL_NONE: No hardware flow control. PERIPHERAL_UART_HARDWARE_FLOW_CONTROL_AUTO_RTSCTS: Hardware flow control uses RTSCTS.